Pekingese hail from the ancient city of Peking, China, now known as Beijing. They were originally bred as a lap dog, watch dog, and companion dog. They are regarded as one of the oldest breeds of dogs. Only the royal class of China was allowed to own a Pekingese. In fact, commoners had to bow to them, and you could be punished by death if you stole one. When an emperor died, his Pekingese was sacrificed so it could go with him to give protection in the afterlife. In 1860, British and French troops overran the Summer Palace during the Second Opium War, and the Imperial Guards who protected the palace were ordered to kill the little dogs to prevent them from falling into the hands of the “foreign devils.” However, five puppies were rescued and given to Queen Victoria. One of the puppies was aptly named “Looty”. It was from these five puppies that the modern Pekingese was formed. They were first recognized in America in 1909. The pronunciation is PEKE-in-ese. The Pekingese is brave, self-assured, and independent. They can be extremely affectionate with their owner but wary of strangers. The breed is good with kids as well as other dogs and pets. However, as with any dog, you must teach young children how to properly play with them to avoid any unintentional injuries. Pekingese can be a little difficult to train. A firm and consistent touch is necessary. They are moderately active which makes them ideal for an apartment lifestyle and indoor living. 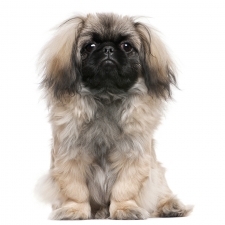 Pekingese usually weigh between 8 to 14 pounds and stand approximately 6 to 9 inches tall. They have a big head and a stocky, barrel-shaped body carried about on very short legs. They have slightly prominent eyes with a flat face. Their coat is very long and comes in a variety of colors. In fact, you’ll need to comb it several times a week as they shed profusely. If maintenance proves too hard, you can simply trim their hair and give them a crew cut - Purists won’t like it, but the dog won’t mind at all, especially during the summer months. Pekingese are the 26th most popular dog registered with America's Pet Registry Inc. They were known as “sleeve dogs” because they were often seen clinging to the sleeves of nobles’ robes.